Saturday, February 2, 2019 Many restaurants in Puerto Escondido, will offer tamales for the end of Christmas season. Sunday, February 3, 2019 10:00 am. La Reforma Mixtepec waterfall, 2 hours from Puerto Escondido. Fiesta and fishing at the river. Lunch with the residents of the town. Get directions at the tourist booth in front of Hotel Rocamar in Puerto Escondido, Oaxaca. February 9 & 10, 2019 9:00 am. Pelota Mixteca at Bajos de Chila. This is a special ball game unique to Oaxaca. Suggest breakfast in Chila at Restaurant Malu. Chila is just west of Puerto Escondido on Hwy 200. Thursday, February 14, 2019 Día del Amor y Amistad. Day of San Valentin. Friendship day. Special offerings by restaurants in Puerto Escondido. Cultural Folk dances at 8:00 pm followed by fireworks. Get reservations with travel agencies to drive you there. Saturday, February 16, 2019 7:00 to 11:00 pm. 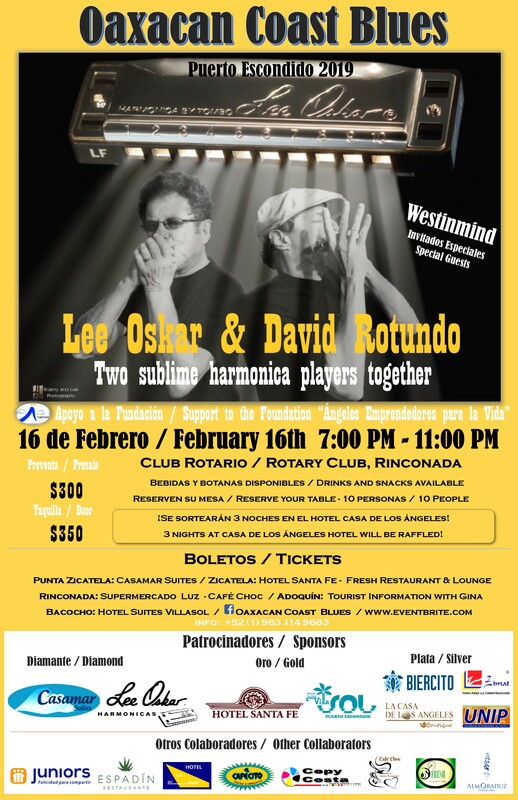 Oaxacan Coast Blues featuring Lee Oskar & David Rotundo. $300 pesos advance at the tourist booth, $350 pesos at the door. See Flyer. For information on daily activities, see Gina at the tourist booth in the Adoquín in front of the Hotel Rocamar. There are great musicians in town making great entertainment in some restaurants this month, come to get the best information at the tourist booth. every Saturday: Gina's walking tours. 8:00am to 10:00am. Make a reservation at the tourist information booth. every Sunday: Gina's Agricultural Tour. 3:30 pm. A visit to the rural Oaxacan coastal area where organic crops are king. See how jamaica and basil are cultivated. Visit tropical orchards and meet local farm families. Make a reservation at the tourist information booth. Archaeological Tour, Cooking Classes, Cacao nature tour, museum tour: Ask at the tourist information booth. As with any changing web content, you may need to use your Reload for Refresh button to see the most recent version of this calendar. For further information on many of these events, try Gina, the Information Goddess, at the tourist information booth, (954) 582-1186. The town of Puerto Escondido was established in 1928 as a port for shipping coffee, although the area has been inhabited by indigenous populations for centuries. In the 1960's it was connected to other coastal towns by Highway 200. Tourists began to discover the town and surfers found its beaches. Its importance as a port diminished as coffee shipments began going by truck instead of boat. The port does continue to support commercial fishing activity. Today, Puerto Escondido is a home for fishermen, surfers, vacationers, and an ecletic expatriot community. On 10/29/09 Agencia Puerto Escondido was upgraded to Ciudad Puerto Escondido, reflecting its rapid growth and importance to the state of Oaxaca. The large waves of Zicatela beach put it into the top ten surfing destinations. It does not cater to the high end tourist as much as Huatulco to the east. Its sprawling beaches host numerous small to mid-size hotels and restaurants. There are three main beaches, Playa Principal, Playa Marinero, and Zicatela, close to the main part of town, as well as several other smaller beaches to the west. Playa Principal is the more centrally-located beach. Parallelling the beach is Avenida Perez Gasga, a pedestrian-only street known as the Adoquín. Presiding in the tourist kiosk at the west end of the Adoquín is the legendary Gina the Information Goddess. The Andador Escénico Sea Walk begins at Playa Principal and winds westward along rocky oceanside cliffs. About 2 blocks up the hill from the Adoquín is coastal highway 200 and on the other side of that is the downtown business district where you can find banks, the mercado, etc. Another manifestation occurs during the annual Fiestas de Noviembre, a complex stream of events that extends through the month of November and into December. Fiesta events are held in both halves of the community with little or no coordination between the two political entities. It all turns into a bit of competition but for festival attendees it just means there are more choices. See the area beaches from the air with tomzap's Aerial Photos of the Playas. Follow this link to www.mexico-condo.com for some nice aerial photos that show the layout of the area. Playa Bacocho is northwest of town past Playa Carrizalillo. Take highway 200 northwest toward the airport and follow the signs to the Posada Real. This is one of the longest beaches in the area. There is a restaurant. Swimming may be dangerous due to heavy surf and undertow. One of the world's best surfing beaches is Playa Zicatela, especially during the months of July, August, and September. The 2-mile long beach has several restaurants and hotels. Not good for swimming, extremely dangerous. To get there, walk southeast along Playa Principal or take highway 200 southeast and turn right at Bungalows Villa Marinero onto a paved road which leads to Hotel Santa Fé and continues south along the beach. More beach information and photos on Dennis Miller's web page. See also, Southern Mexico's Hidden Port, an article by Geri Anderson. Tidal variation is usually no more than three feet. As far as I can see it is not really a factor for those enjoying the beaches, but in case you are interested, here is a link to tide information for Puerto Angel (42 miles or 67 km east) by David Flater. Fog is extremely rare on the coast of Oaxaca. A note of caution: There have been reports of incidents of crime taking place on the beaches at night. Avoid remote beach areas at night. Beach lighting has been added. The high season is December 21 through April 15, with rates usually at least 20% higher. Reservations are recommended for Easter week and Christmas week 6 months to a year in advance. During the remainder of the high season there will normally be many vacancies although some hotels will be full at times. The locations of some hotels are shown on the map of Puerto Escondido. This is only a partial listing. There are many more hotels, especially in the downtown area. In addition to hotels, you will also find condos, apartments and villas listed. Pricing on these alternative accommodations is often quite reasonable. Rentals of condos, apartments, and villas are also available through local real estate agents, which are also listed below. Information is available on making telephone calls. The principal areas for tourist hotels are Zicatela Beach, the long surfing beach in the southeast part of Puerto Escondido, Playa Principal, the more centrally located beachfront area, and the westward residential areas of Rinconada, Carrizalillo, and Bacocho. The downtown section is located across the highway from the Playa Principal area. Additional accommodations are available in Mazunte, San Agustinillo, Zipolite, and Puerto Angel, well to the east and Jamiltepec, well to the west. Aldea Bacocho (954) 582-0335. Monte Alban 5. 28 rooms. Ben Zaa (954) 582-0523, 582-0572 (fax). 15°51.631'N 97°04.194'W. US$20 double. Fishing packages. Bungalows Villa Maria del Mar Calle del Morro s/n, on Playa Zicatela. (954) 582-1091. US$25 double. Beach front bungalows, restaurant, pool, hot-tub, clean and quiet. Casa Blanca (954) 582-0168. Calle Adoquin, Centro Puerto Escondido. Pool, restaurant, 2 rooms have AC. US$22 low season, $33 high season (8/00). Casas de Playa Acali (954) 582-0754 Cabanas located on Calle de Morro by Playa Principal. Kitchenettes, pool. Casamar Suites (954) 582-2593. Located near the beach and a few blocks from the left point break at the end of Playa Zicatela. 11 one- and two-bedroom suites. booknow@casamarsuites.com. Review. Castillo de Carrizalillo (954) 582-1771, 582-1770 (fax), Calle del Castillo, 5-minute walk to beach. Bar, pool, English, Spanish, French spoken. US$42 for a double, includes breakfast. Castillo del Reyes (954) 582-0442 On Avenida Gasga. Clean rooms, showers with hot water, some air conditioned rooms. No pool or restaurant. Recommended. Beach Hotel Ines (954) 582-0792 or 20416 (fax), on Zicatela beach. 15°51.179'N 97°3.324'W This place looked great although I only got a peek at the interior of the rooms from doors left open by guests. The architecture was lovely, beautiful tile work and colors. It was tucked away from Calle de Morro a bit by the front drive and lush plant life. Kitchenettes, pool, English spoken. from $25-48 (U.S.) for two people (11/06). PedroVoss@yahoo.com Recommended. Loren (954) 582-0057 On Avenida Alfonso Pérez Gasga 507. Ceiling fans, balconies, television, pool. Mayflower Hotel and Hostel (954) 582-0367, 582-0422 (fax). Near the west end of the adoquín, 1/2-block from the beach. 15°51.673'N 97°3.902'W. Email: minnemay7@hotmail.com. Ceiling fans, kitchen available to guests, safety box for valuables, inexpensive, recommended. Monte Cassino (954) 582-0570 On the east end of the mall. Ceiling fan, restaurant. Las Palmas (954) 582-0230. In the pedestrian mall. Ceiling fans, three-story, restaurant, garden. Long popular with the Mexican tourists. Pink Moon Hostal Playa Zicatela. 15°51.353'N 97°3.437'W. Hostal for women. Playas Hotel (954) 127-1083 (Mexico), (408) 915-5526 (U.S.). Calle Nogales and Fresnos. Email: sunsetpuerto@gmail.com. Roca Mar (954) 582-0339 On the beach at Avenida Alfonso Pérez Gasga 601. Ceiling fans. About $25 U.S. for a large double. Puerto de Sol Bungalows (954) 582-2922. Nice hotel with common kitchen and pool. US$160/week. San Juan Hotel Felipe Merklin #503. (954) 582-0518. Near Perez Gasga street, the Crucero, and the bus station, 200 mts. from the beach. 15°51.665'N 97°4.007'W. Pool, ocean view, parking, restaurant. 4 rooms have AC, 1 has kitchenette. sanjuanhotel@prodigy.net.mx. Doubles start at US$30 (3/08). Villas Los Delfines (954) 582-0467 (voice/fax) Located at Cerro de la Iguana, Carretera Costera del Pacifico, Km. 71, Box 150. Eight cabanas spread out over a hillside overlooking the Pacific. The cabanas have kitchens, separate bedrooms, television, hammocks outside. There is a path leading down to Playa Zicatela. Restaurant and pool. Arco Iris (954) 582-0432 (voice/fax) Located south of the Santa Fé on Playa Zicatela, Calle del Morro, Box 105. 15°51.306'N 97°3.401'W. Ceiling fans, balconies with hammocks, some rooms with kitchenettes. There is a restaurant on the third floor (named best value in the Best of Puerto Escondido), pool, pool bar, surfboard rentals. The rooms are from US$68 for two people (1/06). hotelarcoiris@prodigy.net.mx Recommended. Photo. Casa Maravilla 045 (954) 100-3402 (cell in Mexico). Oceanview apartments for rent by week, month, and year. Pool, Wi-Fi, cable TV. sibyllea2000@hotmail.com. Casa Rebecca (604) 644-9612 (Canada). Near Playa Carrizalillo. Oceanview 2-bedroom condo with pool, Wi-Fi, and rooftop palapa. La Casita en el Acantilado The Little House on the Cliff One-bedroom, oceanview home with fully equipped kitchen, Wi-Fi. Condominios Carrizalillo A group of 20 privately owned condos located between the beaches at Puerto Angelito and Carrizalillo in the Bacocho neighborhood, a ten minute walk from town. Beautiful grounds, pool, maid service, fully equipped and furnished, with spectacular views. Eglantina Condo #2 (907) 479-2189. Email: dmiller@polarnet.com. Spacious oceanfront condo with 2 bedrooms, 2 baths, full kitchen. Days Inn Villa Sol (954) 582-0382 On Playa Bacocho near Jardín Escondido. Advertising US$120/day but accepting US$40. (12/04). Eglantina Condominium Complex (954) 582-0027. Oceanside condos, sales and rentals. Email: lisettereal@hotmail.com. Twin Cottages Located in the Rinconada area. Two cozy apartments with 2 beds, one bathroom, Wi-Fi, pool, and rooftop lounging area. Available for 1-week or longer stays. Email: palomaspto@yahoo.com. Villa Belmar on Zicatela beach. (954) 582-0244 Email: sun@villabelmar.com Offers free Wi-Fi in hotel areas to the public and provides internet access for hotel guests at computers located in the reception area. Inexpensive International IP Telephone service is offered. Garden, views. Have reports of charges being higher than quoted--suggest paying at the time of quote. US$81 (2/09). Villa Moravia (954) 582-3759, (954) 582-1676 (Mexico). Pool, ocean view, within walking distance of Playa Carrizalillo. Bungalows, apartments, and house for rent. melendez.silvia@gmail..com. Camino del Sol (954) 582-0243 Carretera Costera, km 1.5. Casa Linda Located next to the lighthouse. 3-bedroom, 3-bath oceanview home for rent, with Wi-Fi, pool and garden. Casalinda1@gmail.com. Olas Altas Avenida del Morro No. 310, on Zicatela beach, next to Cafecito. (954) 582-2315, 582-0094. 15°51.203'N 97°4.340'W. Attractive, new. Hotel Paraíso Escondido (954) 582-0444, 582-2767 (fax). Located 3 blocks from the beach at Calle Unión #10. Picturesque, air conditioning, balconies, gardens, restaurant, pool. Clean and funky--suggested. info@hotelparaisoescondido.net. Photo. Santa Fé (954) 582-0170, 582-0260 (fax) Between Playa Marinero and Playa Zicatela on Calle del Morro, Box 95. Ceiling fans, air conditioning, TV's available, restaurant specializing in seafood, bar, pool, boutique. Cars, bicycles, and kayaks are available for rent. Rates from $126 low season for a double (6/09). Suites and bungalows also available. Popular. Photo. Email: info@hotelsantafe.com.mx. Suites La Hacienda Located on the Rinconada. hacienda@escondido.com.mx. 6 suites with kitchenettes, pool, hotel service, French restaurant open from November to April. US$81 low season/$121 high season (6/02). Villas Chakaron (954) 588-7912, 107-2462, 107-2461 (Mexico). (361) 813-1752 (USA). 2-bedroom, 2-1/2 bath oceanview villas. lighthousehillproperties@yahoo.com. Coco Realty (954) 582-3719, (555) 351-1474 (Mexico), (281) 764-6500 (U.S.). Homes for sale, rentals, land for sale. admon@coco-realty.com. Lighthouse Hill Properties #16 Calle Manzanillo. (954) 588-7912, 107-2462, 107-2461 (Mexico). (361) 813-1752 (USA). Homes, lots, and properties for sale. Rentals for all budgets. lighthousehillproperties@yahoo.com. Puerto Escondido Estates (954) 582-0027. Homes and condos for sale and for rent. Lots and apartments for sale. lisettereal@hotmail.com. Real Estate by Nancye. (954) 582-3130, (954) 582-3557 (fax). Nancye Radmin. Nancye Radmin. Condo, home, and apartment rentals in Puerto Escondido. www.puertorealestate.com. Trailer Park Palmas de Cortés near Playa Principal. Electricity, restrooms, laundry, kitchen, grills. Operated by Posada Cortés. Trailer Park Cabañas de Cortés Cabañas, restrooms, fans, garden, grills, hammocks. Operated by Posada Cortés. Campamento Ecologio Ayuda Las Tortugas Playa Barra de Colotopec. by donation. Huatulco Trailer Park Not in Puerto Escondido but in Huatulco. Carmen's Cafecito (954) 582-0516 next to Bungalows Acuario on Zicatela beach 15°51.130'N 97°3.301'W. Another location on the Rinconada, 15°51.705'N 97°4.697'W. Great breakfast, bakery, and rich coffee. Highly recommended. Los Caracoles (954) 582-0556. Calle Playa Marinero. Oaxacan cuisine. 7:00 - 22:00, 7 days a week. Recommended. Ciprianos Pizza Calle de Morro. Italian food, pizza. Los Crotos On the Adoquín (Perez Gasga). 15°51.667'N 97°3.846'W. Recommended. Danny's Terrace at the Rincón del Pacifico on Playa Principal. GPS 15°51.665'N 97°3.779'W. Recommended for lunches. Espadin in the Hotel Villas Carrizalillo. 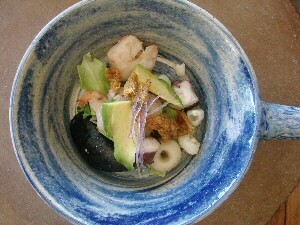 Mexican comida by Chef Patricio Sanoval. Overlooking Playa Carrizalillo with spectacular sunset views. Disco beach Villa Sol Located at the Hotel Villa Sol beach club. Opened Nov. 2002. La Huerta de Don Juan Located on the Río Colotepec in nearby Barra de Navidad. Photo. La Juquileña (old location) on 8th street between the market and Av. Oaxaca, 15°52.189'N 97°4.324'W. Mexican food. Actually the restaurant moved to another location and the new tenant kept the name as well so now there are two Juquileñas. La Juquileña (newer location) corner of 10a Norte and 4a Poniente. Large, busy restaurant with long tables. Regional Mexican food, large selection, highly recommended. María's Playa Marinero in the Hotel Flor de María. Pasta, seafood. Recommended. Mario's Pizzaland (954) 582-0570 Avenida Gasga, east of the pedestrian area. Paris On the Rinconada. Open end of October 2011. Punta Paraiso Located on the road to La Punta on Playa Zicatela--the last palapa style restaurant. Opened March 3, 2007. Excellent salads. Rincon del Pacifico on the Adoquín (Perez Gasga), middle of Playa Principal. GPS 15°51.663'N 97°9.792'W. Sabor al Mar (owner used to have Junto al Mar) Was on Playa Zicatela, moved to Playa Marinero on the rocks in front of Hotel Santa Fé. Voted best seafood in the Best of Puerto Escondido. La Salsa 3A. Poniente, just west of Ben-Zaa Hotel. Mexican food. Open for lunch and dinner. Sativa Calle del Morro on Playa Zicatela. Seis Palmas now renamed Espadin. Clifftop oceanview restaurant located at Villas Carrizalillo. Mexican/International/Fusion cuisine. 7:30am to 10:30 pm, closed Thursdays. See review. El Tabachin (954) 582-1179. At the Hotel Tabachin on Zicatela behind Hotel Santa Fe. 15°51.461'N 97°4.493'W. Email: tabachinpaul@gmail.com. Opens at 8:30, recommended for breakfast. Photos. Taquería Mayra is located one block east of the newsstand on Avenida Oaxaca. Regional menu, try the tlayudas with beef or chicken. Taquería La Playita on Av. Raul Gonzalez near the airport. Best tacos de pastor anywhere, but I have received one negative report (10/02). Photo of Silvio at work. See Italian Restaurants in Puerto Escondido, an article by Linda Green and company. Casa Vista Linda (801) 554-4799 (USA). 2-bedroom, 3-1/2 bath oceanview villa located near the lighthouse. Chila Resort Oceanfront vacation homes for sale. 2 and 3-bedroom homes with private pool. Resort features common areas, managed rental program. Costa Cumaná (954) 582-0929. Pablo Ambrosi Cortes. Residential development. Office: Av. Perez Gasga s/n Zona adoquinada Abajo de la perla flameante. Eglantina Condominium Complex (954) 582-0027, Lisette Levasseur. 2-bedroom, 2-bathroom oceanside condos. Email: lisettereal@hotmail.com. Gecko Realty (954) 582-0023. Homes, commercial property, and land for sale. Vacation rentals. Large Lot for Sale in Carrizalillo area. 2400 square meters, ocean views. laraceci@yahoo.com. Notaria 14: Alina Felix (954) 582-0739. Oaxaca's leading provider of Fideicomiso Trusts. English-speaking. notaria14@gmail.com. Planning and Zoning in Puerto? an article by Sheila Clarke on how the process almost works in Puerto Escondido. Vivo Resorts Puerto Escondido Comes of Age with Luxury Oceanfront Homes & Condos, an article by Alvin Starkman. Real estate for rent is listed with the hotels above. Puerto Escondido is considered one of the top 10 surfing locations in the world with Zicatela the primary beach. The main surfing season is April to October when ground swells in the 6-15 foot range break into hollow tubes. Wipeouts can be punishing for surfers and their boards. This is for experts only. International competitions are held in August and November. Read about surfing Escondido in an article by Christian D. Lyman. National Surfing Mexico holds in event in May on Playa Zicatela. One Surfing Competition is held in November during the Fiesta de Noviembre. The Mexpipe Surfing Competition is held in August. The World Masters Championship surfing competition is held in Puerto Escondido normally around the second week in August. Read about the 1998 World Masters Championship surfing competition. Aerial Photos of Playa Zicatela taken by Tom Penick in 2009 with links to other aerial photos. Central Surf Calle del Morro, Playa Zicatela. Another shop in the pedestrian area. (954) 582-0568, 582-2285, 582-2285 (fax). Rentals, instruction. Web page. Oasis Surf Academy (954) 582-1445 (Mexico). Boulevard Benito Juárez local #6. Lessons for beginners, surfing equipment and transportation provided. Oasis Surf Factory (954) 582-1445 (Mexico). Calle Bugambilias, Playa Zicatela. Custom surf boards for all types of surfers, new and used boards for sale. Tide Information: Tidal variation is usually no more than three feet. See also surfing in Salina Cruz, Oaxaca. Beach cam from Pacific Coast Travel Info. Underwater Puerto Escondido Photos from Scott Sousa. Chencho 044 (954) 588-4233 (cellphone), (954) 540-2897. Boat captain and guide. English-speaking, recommended. Golf: Las Parotas (958) 581-0171. Club de Golf in Huatulco. Gina can make reservations for golf for you. Hidden Voyages Ecotours Located at Turismo Dimar. Michael Malone. Email: sales@peleewings.ca. Guided tours Dec. 15th - March 25th. Michael's bird list and photos. Link to web page. Producción Ecoturistica (954) 588-7376, 582-0720. Ecotours in the Barra Navidad area to see birds, crocodiles, turtles, iguanas. Restaurant. Rancho los Compadres (954) 582-2742 (Mexico), 044 (954) 101-0276 (cell in Mexico). Horseback riding. English spoken. $350 pesos and they will take you to Malucano at the river and drive you back. A Sailfishing tournament is held annually in late November. Dates for the 2005 fishing tournament are November 25, 26, and 27. Cost for 3 days with boat and captain is $15,500 pesos. For reservations call (954) 582-1678 (Mexico). Things To Do In Puerto Escondido an article (mostly) by "cewjalw", taken from the Visitors' Comments. Puerto Escondido Tours (954) 587-0787, 587-0778 (fax) Boulevard Benito Juárez Fracc. Bacocho. Excursions, boat trips, fishing. Tropical Birds Forum Online discussion of tropical birds. Turismo Dimar viajesdimar@hotmail.com 905 Av. Pérez Gasga. Guided tours, flight and travel arrangements, horseback riding. Offers transportation from Huatulco Airport for 800 pesos (3/10). Walking Tours by Gina, the Information Goddess. A city tour and other tours are available. Puerto Escondido Sport Held in May. Surfind competition, music, dancers of the black communities. Big Independence Day celebration September 15. Celebrations begin a few days early with music, displays, surfing, flags, etc. Día de la Marina or Navy Day on June 1, began to be celebrated in Mexico in 1945. In Puerto Escondido, it was usually a dinner for the fishermen, but in 2003 the celebration included a fishing tournament. About 14 boats competed for 4000 pesos in prize money. Día de los Muertos An annual Día de los Muertos Tour is conducted by Gina, the Information Goddess. Fiestas de Noviembre Throughout the month of November and into December are the Fiestas de Noviembre. There are a number of competitive events including surfing, fishing, culinary, and beauty contests. Also featured is traditional dancing, music, parades, and food. The fishing competition is a huge event with automobiles given to the top winners, contact (954) 582-1678, 102-4090 or pescandopuertoescondido@live.com.mx. On December 18 is the more traditional festival Virgen de Soledad, honoring the patron saint of Oaxaca and protector of fishermen. The Virgin is taken by boat in a large procession by boat to the outskirts of the bay and then returned to the church plaza. Dancing, fireworks and bullfights are included in the festivities. ADO/Cristobal Colón Bus Line The bus station for this line is located on Carretera Costera, next to Telmex (almost in front of the Benito Juárez statue). First class busses go to Tuxtla, San Cristobal, Tapachula, and Salina Cruz. Also Oaxaca City. Airline: Aerotucan now flying daily between Oaxaca-Huatulco and Oaxaca-Puerto Escondido. Airfares are approximately US$100 one-way. Bus Schedule Schedule information for 4 bus lines and 1 van company provided by the Mayflower Hotel and Hostel. Bus: main bus station is on Avenida Miguel Hidalgo (954) 582-0050. Bus: Cristobal Colón Bus Terminal 15°51.829'N 97°4.058'W. The first class bus runs to Oaxaca via Salina Cruz (the long way) and takes 10 hours. Bus: Estrella Roja and Estrella del Valle have second class busses to Oaxaca that take 7 hours. They are marked Turismo (better), or Director (second choice). Bus: Several operators make the Oaxaca trip using new vans or minibuses. One is located in Oaxaca at 408 Periferico, near the Abastos market. In Puerto Escondido, the location is half a block down from the highway traffic light, right by the large Hotel Mayflower sign. Bus: Another minibus operator is across the street from the Comex paint store on Oaxaca Avenue. Bus: Another minibus service is located next to the Telmex telephone company office close to the traffic light, on the highway. These minibus services offer reasonably-priced local transportation and connect with other services as well. Flight to Puerto Escondido An account of tomzap's 2009 flight to Puerto Escondido in a Piper Arrow. Flight to Puerto Escondido An account of tomzap's 2014 flight to Puerto Escondido in a Piper Arrow. Mechanic: Francisco Mendoza Gonzales Fuel Injection Service. 1a Sur Esq. 2a Poniente, one block east of the Municipal building. Specializing in electronic and fuel injection problems but can fix anything. Reasonable, recommended. Has some used cars for rent. A gear up landing at the Puerto Escondido airport. Travel Agent: Dimar (954) 582-0259 at Av. Perez Gasga 905B, and (954) 582-2305 on Calle del Morro. Transporation from Acapulco and Huatulco airports. Airline tickets, bus tickets, car rentals. Viajes Diamar (954)582-0734, (954)582-0737 (fax), in Puerto Escondido offers transportation from the Huatulco Airport to Puerto Escondido. (3/01). The Puerto Escondido International Airport is located just west of town. Refer to the transportation page for information. This is an important resource that you, the reader, provide to the community by submitting listings, recommendations, and updates for me to list here, tom@tomzap.com. To find medical specialists, you may have to travel to the city of Oaxaca, see Oaxaca Medical. Alternative Healing: The Sanctuary Healing Retreat (954) 110-4020. Quintana Roo, Brisas de Zicatela. Health spa, yoga, pilates, alternative and holistic health. Article: Medical and Dental Treatment and Coverage in Oaxaca, Mexico, an article by Alvin Starkman. Doctor: Mario Francisco de Alba. (954) 582-3581, 044 (954) 100-3660. Located on the Rinconada next to el Nene, but temporarily operating from his drug store "Ollin" outside the Hotel Ines on Playa Zicatella (11/2012). Recommended. Doctor: Dr. Max. (954) 582-0440. Located on Oaxaca Av. 603. Recommended. Doctor: Francisco Serrano. (954) 582-0548. Located on Blvd. del Pacifico 508. Recommended. Doctor: Sergio Pérez Matos. (954) 104-2270. Hospital Angel del Mar, 6a Norte esq 1a Oriente. Ear, Nose and Throat. Monday - Saturday 10am - 1pm, Monday - Friday 5pm - 8pm. Recomended, one of the best in the country. Support: International Friends of Puerto Escondido. This was once a support and resource group, facilitating communcation and cooperation among the foreign community and between the foreign community and local government and providing visitor assistance. However, it no longer provides these services but does continue to operate the IFOPE library. Amigos Internacionales de Puerto Escondido Library located at 10 Benito Juarez, Fraccionamiento Rinconada. Lending library open to the public. Books in English Spanish, French, German and Italian. Videos and DVDs. Donations accepted. Bajos de Chila Town located a few minutes to the northwest of Puerto Escondido featuring a large annual festival in February and the site of the national Pelota Mixteca Tournament. Barra de Navidad Colotepec The village is 4 miles southeast of Puerto Escondido on the banks of the Río Colotepec. Cacalotepec The village is approx. 30 km west of Puerto Escondido. It has a big broad beach that sometimes has a good surf break but is better for boogie boards. Puerto Escondido sports fishermen often bring clients here to fish yellow fin tuna and gallos. It has some great palapa restaurants on the mainland beach, frequented by Puerto locals looking for beaches quieter and more remote than those in Puerto. Roca Blanca is a big rocky island in the middle of this broad bay plastered white from the many seabirds that roost here. Corredor Ecoturistico Ochovenado, an article by Gerhard Buttner on visiting points west of Puerto Escondido, including Jocotepec, Mata de Ajo, Santa Ana, and Tutuepec. Hot springs of Atotonilco (Aguas Termales Atotonilco) are located near the village of San José Manialtepec, about 15 miles west of Puerto Escondido. See map (90K). It's a two-mile hike or horseback ride up the Río Manialtepec canyon. A guide from the village is recommended. Lagunas de Chacahua National Park is located 41 miles west of Puerto Escondido or 51 miles east of Pinotepa Nacional at coastal highway marker km 82. It is 54.8 square miles (14,187 hectares) in size and encompasses 20 miles of open-ocean shoreline and jungle lagoons. Web Site: www.lagunasdechacahua.com. There are five towns located within the park: Chacahua (accessed by boat), El Azufre, Zapotalito, Charco Redondo, and El Corral (on an island). The park's administrative center is located in Tututepec. Fishing is strictly licensed. There are numerous species of fish and wildlife. Crocodiles are being restored to the area by a hatchery at Chacahua village on Laguna Chacahua. Bird life includes pelicans, herons and cormorants. Excursions by boat are available from Zapotalito, which is the only easy access point to the Lagunas de Chacahua. There are a number of islands in the lagoons that are suitable for camping and wildlife viewing during the dry months. You can have a boatman drop you off and pick you up later. Playa Hermosa is a good place for snorkeling. The 18-mile dirt road from San José del Progreso to Chacahua is very rough and usable in the dry season only. Check the road conditions before attempting this trip. Hotel Siete Mares, on the west side of the village, has rustic bamboo cabañas, cabins, a small restaurant, showers, and is close to a beach. Playa Chacahua is a 10-mile long beach, suitable for snorkeling and fishing, and surfing on the west end. Mixtec Ceremonial Center The archaeological site was discovered in early 2000 just east of Puerto Escondido and is considered a major discovery. Walking tours are conducted by Gina, the Information Goddess. Rio Grande is a village of 5000 and is the service community for the Lagunas de Chacahua area. There you will find grocery stores, a bank, pharmacy, doctor, telephone office, and a hotel. The Hotel Santa Monica, Avenida Puebla, Rio Grande, Oaxaca 71830, has ceiling fans, toilet, hot water, $13 U.S. for a double. There's a restaurant across the street. Tiltepec, a poverty-stricken town with an epileptic and deaf population of 40%, located 15 miles northwest of Puerto Escondido (straight-line distance). Article: 5 Weeks in Puerto Escondido a travelog by Alan Vlautin. Article: Abraham Levy kayaks the length of both coasts of Mexico. Article: Aldo Marino Ciardiello: Sculptor, Painter, Set Designer - Puerto Escondido, Oaxaca. In Memoriam, June 4, 1954 - April 29, 2010. Article: Exploring Oaxaca An article by Sheila Clarke about her excursion to the Albergue of Buena Vista. Article: House of Screws, an article by Puerto Bill on the non-touristy shops of Puerto Escondido's business district. Article: Machete Making An article by Dennis Miller on how machetes are made in Nopala, Oaxaca. Article: Prostitution A primer on prostitution in Mexico and the story of Tony's Bar. Article: Southern Mexico's Hidden Port an article by Geri Anderson. Article: Tales of the Heart, an article by Kenneth Richards. Article: Whatever Happened To . . . ? a quick recap on some of Puerto Escondido's infamous characters by "Farkem", taken from the Puerto Escondio Visitors' Comments, October 2006. Why Did the Gringos Cross The Border? an account by Diana Tullio of one family's experience in coming to Puerto Escondido and buying a condo. El Arte de Mi Tierra on the Rinconada. This store has many beautiful things such as light fixtures, sinks, kitchen supplies, furniture, hammocks, ceramics, textiles, etc. The articles are good quality, not much cheap stuff. Recommended. Art Supplies (painting) Two stores, El Ojal and Comex, both on Av. Oaxaca, sell paints for artists. There is an artist studio on 1a Poniente that may have more information for artists. There is also Galeria Diana on Calle 1a Oriente near 2a Norte where owner, Conchita, may have suggestions. ATM - Playa Principal There is an ATM machine on the adoquín. ATM - Zicatela HSBC on Zicatela. 15°51.183'N 97°3.328'W. As of 11/06 the ATM booth was new and did not yet contain an ATM machine. Best of Puerto Escondido. Readers comment on their favorites. Computer: Graficom at 302 Avenue Perez Gasga. (954) 582-1853, 582-1313, graficom@ptoescondido.com.mx. Public email services, internet service, fax, telephone, snacks, air-conditioned. Buying a Hammock Video clip. Coffee: La Casita (954) 582-1342. Av. Oaxaca, west side of the street about halfway up, but may be moving soon. Roasted coffee beans or ground, from Pluma Hidalgo at better prices than can be found at the source. Recommended. David Crews Puerto's notorious Person of Interest. The twisted tale of a local icon. El Faro The lighthouse is a Puerto Escondido landmark. Hardware Stores Some commentary on the hardware stores of Puerto Escondido, taken from the Visitors' Comments. International Friends of Puerto Escondido, a support and resource group, now disbanded, who facilitated communication and cooperation among the foreign community and between the foreign community and local government. Visitor assistance. Garden: El Jardín Botanico Hwy 130, 8km north of Puerto Escondido. Botanical garden open from 8am to 3pm, Spanish-speaking guides, student from UMAR. Gina, the Information Goddess (954) 582-0276 (English, Spanish, French). Tourist information from the Oaxaca Tourist Bureau. Email: GinaInPuerto@Yahoo.com. Grocery: Chedraui Superstore Puerto Escondido gets a new Chadraui Superstore in 2008. Grocery: Tresele Food Service Av. Pérez Gasga #303, near the Banamex. (954) 104-2336. Frozen foods: American cuts, fruits, vegetables, fish, seafood. Recommended. Language School: Barbara Schaffer (954) 100-3507, (954) 582-2993 (Mexico). Certificated U.S. Spanish teacher, 20 years experience. Private classes only. Language School: Oasis Language School (954) 582-1445 (Mexico). Boulevard Benito Juárez local #6. Private and group instruction, home stays. Missing Persons Help us locate missing persons. Mixtec Archaeological Site A Mixtec ceremonial center was discovered in early 2000 just east of Puerto Escondido and is considered a major discovery. The site has about 10 pyramids and a ball court. A number of large carved stones have been found. Situated on a hilltop, it commands a spectacular view of the Pacific coast. The site is not open to the public. Newspaper: El Sol de la Costa (954) 582-2230. Monthly free newspaper in English and Spanish, distributed at numerous businesses in Puerto Escondido. Web: www.soldelacosta.com. Newspaper: El Despertar de la Costa Weekly Spanish language online newspaper includes an English section as well. Newspaper: Viva Puerto Digital online magazine about all things Puerto Escondido by Barbara Shaffer Email: Vivapuerto1@gmail.com. Web: vivapuerto.com. Naturalista, a natural food store, is located across 3 Poniente from Ahorrara. It is sometimes open from 10 AM to 9 PM, but the hours are irregular. Oaxaca Tourist Bureau (954) 582-0276 (English, Spanish, French). located in a booth just west of the pedestrian mall. As for "Gina" (Gina Machorro Espinosa, "the information goddess") Email: GinaInPuerto@Yahoo.com. The main Tourism Office is located on Blvd. Benito Juárez near Hotel Bazar in the Bacocho area, (954) 582-0175 (Spanish only). Pelota Mixteca Ball Court Traditional sport being played today. Perros in Puerto (PEP) Non-profit organization addressing the stray dog problem in Mexico. Goals include taking strays off the street, finding homes for dogs, offering kennel services, spaying and neutering. Pilates in Puerto. Escuela de Pilates 954-109-1794. 3a. Poniente #104, sector Hidalgo. Group and private exercise classes using the Pilates method. Puerto Escondido The Hidden Port. an article from the Mexican Meanderings newsletter. Puerto Escondido Travel Essential Application for the iPad or iPhone with quick access to Puerto Escondido information. Download the free Sutro World app at www.sutromedia.com/world or in the iTunes store. Then type �Puerto Escondido �in the search box. Cost $2.99. Scuba: Buceos H2O Avenida del Morro offers scuba diving. Boat dives $40 per person and up, equipment included. Storage: Mini Bodegas del Puerto (954) 582-1451. Av. Infraganti #23-B. Self-storage facility, various sizes available. sunamerica41@yahoo.com. Andador Escénico Sea Walk between Playa Principal and the Eglantina condos. GPS 15°51.402'N 97°4.161'W. Tony's Bar Puerto Escondido's legendary brothel is no more. Tropical Storm Matthew 2010 dumped a huge amount of rain on Puerto Escondido causing major damage in September 2010. Trip Report 2006 Tomzap explores Puerto Escondido during the Fiestas de Noviembre. Weaver: Manteleria Santo Domingo (954) 109-3738. Av. Perez Gasga #204. Textile weaver and clothing maker. See wooden looms in action and purchase products. Youtube video of loom available. Working People of Puerto Escondido A Photo Album by Thomas Marquardt. Year-End Sunset The traditional observation of the final sunset of the year on Playa Zicatela. Yoga: Classes and Events Calendar of yoga classes, events, and spiritual activies in and near Puerto Escondido.